Got wiggly kids? I sure do! I've got kiddos that wiggle all day long! There are numerous strategies for these kids to help them get the wiggles out and focus more on classwork. One excellent strategy is using Bouncy Bands! There are two different kids of Bouncy Bands. One you can attach to a child's desk, like you see above. 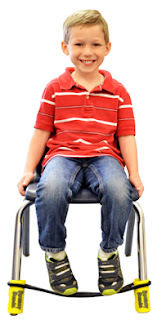 The other attaches to the child's chair like this happy guy below. Both bands allow the children to push or kick against the rubber strand with their feet. 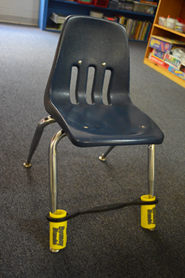 It helps the children with the need to move do so without disrupting others. I wish I had one for every kid! I've seen a variety of foot action with each type of Bouncy Band, but with minimal noise and distraction. It definitely took some muscle to put the Bouncy Bands onto the furniture, but once it was there, the kiddos can go crazy with the bands without damaging them! School is so stressful for the kiddos these days. It's nice to have something for them to relieve a little of that stress. Bouncy Bands are a great option to help these kids! Here's another video from Dr. Oz (I love him!) 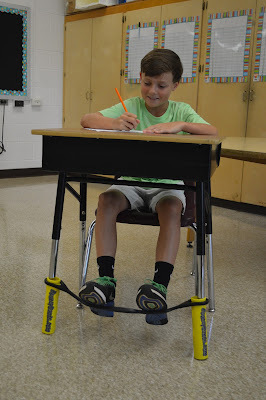 It features the "Read and Ride" program created by Scott of Bouncy Bands, but there is also a mention of the benefits of Bouncy Bands as well! As teachers, we all know the learning benefits of letting kids move! To see more about Bouncy Bands, see THIS link!